American farmers planted more than 19,500 acres (circa 7,900 hectares) of hemp in 2017. That total is nearly double the circa 10,000 acres planted in 2016. The figures are according to Vote Hemp, a lobbying group. The U.S. was led by Colorado, which reported 7,500 acres under the crop this year, up from nearly 6,000 in 2016. Kentucky was the second largest grower, with the state’s hemp farmers putting in 3,000 acres of hemp, only slightly up from 2,525 acres in 2016, Vote Hemp reported. States in the USA work under a government controlled licensing regime in conjunction with state-run universities. 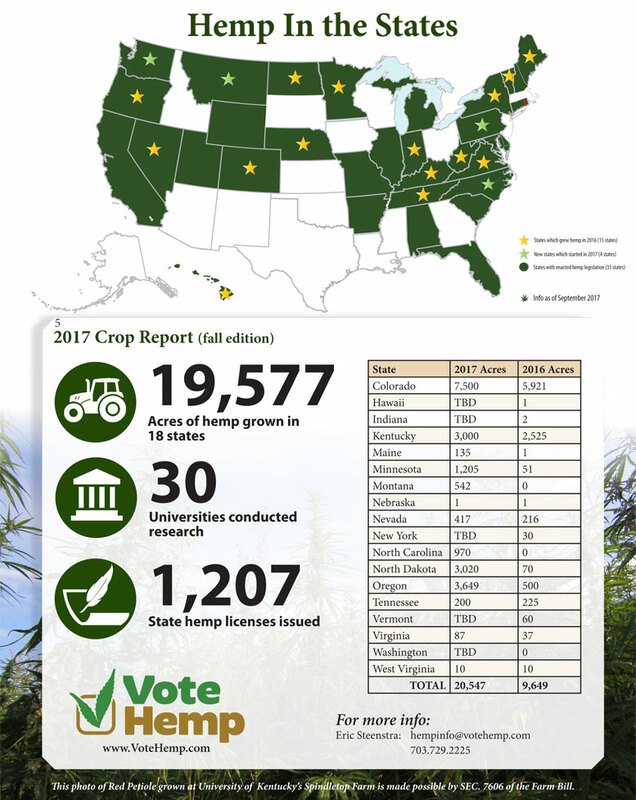 According to Vote Hemp, 19 states and 32 universities participated in hemp trials this year while 1,207 licenses were granted. Restrictions in the USA are holding back hemp domestically — and therefore proven at least a short-term boon for Canadian, European and Asian producers of hemp products. European CBD makers especially have been happy to serve the rapidly expanding U.S. market. But the tightly controlled nature of U.S. hemp puts American growers and processors far behind as other hemp growing nations continue to build out their supply chains and markets. European hemp farmers last year planted some 33,000 hectares (circa 74,000 acres) while a growing number of producers are turning the crops into CBD, food and building materials. The European Union and some federal governments in Europe offer farm supports and make rural economic funding available through various innovation programs into which hemp fits. In the USA, “The majority of states have implemented hemp farming laws, in clear support of this crop and its role in diversifying and making more sustainable our agricultural economy,” Vote Hemp said in a statement, but government oversight still shackles the industry. “It’s imperative that we pass the Industrial Hemp Farming Act in Congress, so that we can grant farmers full federally legal rights to commercially cultivate hemp to supply the growing global market for hemp products,” Vote Hemp said. That Act excludes cannabis strains under 0.3 percent THC from the federal definition of marijuana under the Controlled Substances Act.